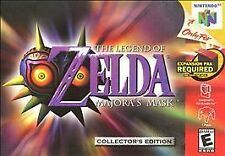 New ListingLegend of Zelda Majora's Mask Nintendo 64 N64 Original Authentic Video Game! Doesn't include box or manual. Item is clean and has minimal wear. 5 out of 5 stars - Legend of Zelda Majora's Mask Nintendo 64 N64 Original Authentic Video Game! 334 product ratings334 product ratings - Legend of Zelda Majora's Mask Nintendo 64 N64 Original Authentic Video Game! Legend of Zelda: Ocarina of Time (Nintendo 64, 1998) Game Only. Condition is Good. Shipped with USPS First Class Package. Legend of Zelda: Majora's Mask (Nintendo 64, 2000). Condition is Acceptable. Shipped with USPS First Class Package. See pictures for actual game condition. There is crack in the cartridge and chips on in the lower corners of the cartridge but it still works. Thats why i desrcibed this as acceptable condition so please be wary of this detail when bidding i will not cancel any bids becuase the item is detailed as such. Zelda Majora's Mask. Nintendo 64. Legend of Zelda: Majora's Mask (Nintendo 64, 2000). Condition is Very Good. Shipped with USPS Priority Mail Flat Rate Envelope. I am selling because I no longer have use for this game. It is in great condition and it is tested and and working condition. 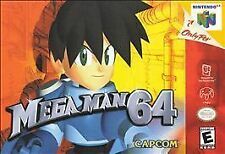 Quest 64 (Nintendo 64, 1998). Condition is Good. Shipped with USPS First Class Package. Legend of Zelda: Majora's Mask. ( Nintendo 64 ). Nintendo 64. Nintendo DS. Nintendo NES. THE PHOTO SHOWN IS AN EXAMPLE. YOUR ITEM WILL BE SIMILAR BUT MIGHT NOT MATCH EXACTLY. Super Nintendo. This item is genuine, original. If you are not happy with it we will work to fix the problem. Quest 64 (Nintendo 64, 1998) CIB Complete in Box NICE! Quest 64 (Nintendo 64, 1998) CIB Complete in Box NICE!. Condition is Very Good. Shipped with USPS First Class Package. 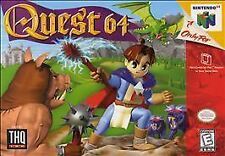 4.5 out of 5 stars - Quest 64 (Nintendo 64, 1998) CIB Complete in Box NICE! 40 product ratings40 product ratings - Quest 64 (Nintendo 64, 1998) CIB Complete in Box NICE! Legend of Zelda: Majora's Mask (Nintendo 64, 2000) N64 Gold cart with manual . Condition is Very Good. Shipped with USPS First Class Package. Legend of Zelda: Majora's Mask (Nintendo 64, 2000) Complete in box Holo . BOX IS EXTREMELY WORN PLEASE SEE PICTURES.Condition is Acceptable. Shipped with USPS First Class Package. Legend of Zelda: Ocarina of Time (Nintendo 64, 1998) authentic. Condition is Very Good. Shipped with USPS First Class Package. The game does work, I do have the box but it is pretty beat up. Legend of Zelda: Ocarina of Time (Nintendo 64, 1998). Condition is Good. Shipped with USPS First Class Package. Legend of Zelda: Ocarina of Time (Nintendo 64, 1998). Condition is Very Good. Shipped with USPS Priority Mail Flat Rate Envelope. Legend of Zelda: Ocarina of Time (Nintendo 64, 1998) with custom case from customgamecases.com, game is Authentic and is tested. Happy bidding! Legend of Zelda: Ocarina of Time (Nintendo 64, 1998) N64. Condition is Good. Tested with an authentic N64 and is working. Pictures are of actual auction item. Legend of Zelda: Majora's Mask N64 - Holographic, Gold -Authentic/Original working condition. This is for the cartridge only. Condition is Very Good. Please message me with any questions! Authentic nintendo cart only, plastic cracked at the bottom, please view pics for condition. Cleaned and tested, works great. Thanks and enjoy the game! The Box is in ACCEPTABLE condition. Up for sale is Hybrid Heaven and Iggy's Reckin' Balls for the N64! Both are Exclusive Classics on the System and they are Both in Excellent Shape with Clean Labels! Both have been tested and work Great! Legend of Zelda: Majora's Mask (Nintendo 64, 2000). Condition is Brand New. Shipped with USPS First Class Package. Legend of Zelda: Ocarina of Time (Nintendo 64, 1998). Condition is Good. Shipped with USPS. No box, just the game. Legend of Zelda: Ocarina of Time (Nintendo 64, 1998). Condition is Good. Shipped with USPS First Class Package. 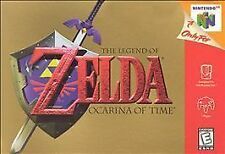 Legend of Zelda: Ocarina of Time (Nintendo 64, 1998) with manual. Manual has wrinkled front and back cover, but most of the manual is good with some bending on the bottom corners. Condition of game is Good. From personal collection. I have not played in years and I no longer have an n64 to test it, but it worked fine the many hours I spent on it in the past. I've had it for over 13 years. Returns accepted (manual must be returned with game) within 30 days in case there are any problems. Thanks. Shipped with USPS First Class Package. The box, instructions and paperwork are in near mint condition with almost no wear. Legend of Zelda: Majora's Mask (Nintendo 64, 2000) N64 Complete In Box Authentic. Condition is Good. Shipped with USPS First Class Package. Legend of Zelda: Ocarina of Time (Nintendo 64, 1998). Condition is Very Good. Shipped with USPS Priority Mail Padded Flat Rate Envelope. Legend of Zelda: Ocarina of Time v1.0, Gold Cartridge, Rare! Legend of Zelda: Ocarina of Time (Nintendo 64, 1998) v1.0, Gold Cartridge, Rare!. Condition is Very Good. Shipped with USPS First Class Package. Has been tested and works fine, no case or manual. Cartridge only. Cover art has been marked on a bit and has faded over time. 5 out of 5 stars - Legend of Zelda: Ocarina of Time v1.0, Gold Cartridge, Rare! 101 product ratings101 product ratings - Legend of Zelda: Ocarina of Time v1.0, Gold Cartridge, Rare! Quest Nintendo 64 N64 OEM Authentic Video Game RPG Role Playing Kids GREAT! Harvest Moon Nintendo 64 N64 OEM Authentic Video Game Cart Rare Retro RPG GOOD!